1X 20CM LEATHER BRACELET WITH LOVE CLASP FOR CHARM. 1X 20cm LEATHER BRAIDED CORD BRACELET WITH WITH BLACKEN LOVE ON CLASP FOR CHARM BEADS. "FREE DAINTY FLOWER CRYSTAL CLIP ON BEAD WITH EVERY BRACELET". You are bidding on 1 20cm Leather Braided Cord Bracelet With Gold Plated Clasp For Charm Beads. 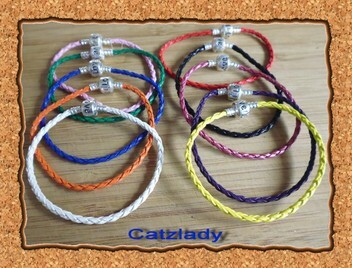 COLOURS FOR SIZE 20cm BRACELETS. 20CMS: WHITE, LIGHT PINK, YELLOW, NO BLACK LEFT, ORANGE, RED, DARK PINK, GREEN, DARK PURPLE AND MEDIUM BLUE. Material: Stamped .925 Sterling Silver Plated Base On Copper And Leather Braided Cord. Size: Approx 20cms In Total Length. Leather Cord Thickness: Approx 3mm.